Ladies and gentlemen and fellow feline friends, feast your eyes on this magnificent architectural giant that is the Kilimanjaro Blackline / Light Grey Cat Tree! This unbelievably practical and stylish cat furniture is extremely robust and is a welcome addition to kick off the brand-new blackline style for 2018. The Kilimanjaro cat tree has been a firm favourite over the last few years and has continued development to ensure that the strongest and most robust cat furniture is provided to the feline world. In 2017, the Kilimanjaro cream colour was our best seller. But, we have a strong suspicion that this will soon become the most popular RHR Quality cat tree that we have available for 2018! If you have a larger breed or are fortunate enough to be the boss of a household with multiple feline friends, then it is really important that they get a cat tree that can withstand all of the crazy feline activity that they can throw at it. 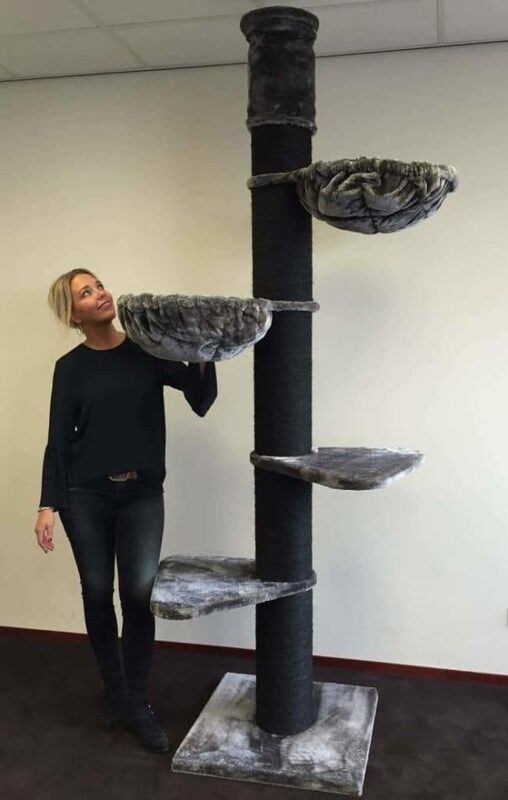 You can be 100% assured that no matter how big your feline friend is they will never be able to conquer the Kilimanjaro Blackline / Light Grey Cat Tree. Even a lion would struggle to scratch the surface of this magnificent beast! A fantastic quality about this product is that each of the levels are interconnecting and have been developed specifically to ensure that your feline friends can get maximum pleasure as they take themselves on their own little adventure as they navigate their way to the top where a plush bedding area awaits them. If you have multiple felines then they will each have a special place that they can call their own as there is also a cosy little hammock as well! Quality product from RHRQuality with stable construction. 45KG total weight! 8 x strong sisal trunks with a diameter of 12 cm with sisal. Base plate: 74 x 59 (4 cm thick) and height: 180 cm. Heavy plush 600gr / m2! Mooring above 60x43x15cm with 2.5cm thick wood and removable 5cm thick cushions. The New 2018 lying bowl> A combination between a pillow and a lying bowl. The dream of every cat. NEW! Amazing! So sturdy for my 2 ragdolls who like to throw themselves at there cat trees! The height is perfect too they love it! A nice size base so doesn’t take up a ton of room! Great quality!